Chic-A-Boo, as you can clearly see, was a cute brown furry monkey toy. It’s face, hands and feet were made from plastic, and being a monkey, it had opposable thumbs which could be inserted into its mouth, which made it even cuter to look at. The toy was originally developed in Japan in the mid to late 1970’s, but it wasn’t until the 1980’s that it became more popular in the UK. 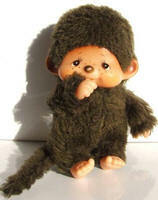 The original Japanese name for the toy was Monchhichi, but since the (intentional) double ‘H’ in the middle was a bit confusing for us Brits, the name was changed to Chic-A-Boo. Similarly, in Italy it became Mon Cicci, and in France the even simpler Kiki. They were created by Koichi Sekiguchi as a way of teaching both children and adults to be loving and respectful, although I dare say he also realised a bit of a money spinner when he saw one. Originally the toys were sold in pairs, with one male and one female doll – quite how you told which was which I’m not sure – probably something as simple as the girl had a bow in her hair. Before long though the toys were sold individually, and a whole range of additional clothing was also launched. The toys were incredibly popular in Japan, but perhaps less so in the rest of the world. I remember though that my sister always wanted one, and I think one day she did get an imitation one. At least, I think it was an imitation one as you could insert the thumbs and toes into both the mouth and, rather more disgustingly, the nostrils. Original Monchhichi dolls don’t have nostril holes, instead having a little brown elliptical nose instead. One thing that does stick in my mind for these dolls though was the jingle used on the TV advert. I’m not sure quite why it lodged in my brain so much (these things do for some reason – obviously a misspent youth watching too much TV) but it went something like this. The range of available Monchhichi was also expanded with the introduction of different animals given a similar design treatment, including gorillas and rabbits, and in Japan they continue to be popular to this day. This entry is filed under Toys - Dolls and Action Figures	and was posted on October 30th, 2009. You can follow any responses to this entry through the RSS 2.0 feed. You can leave a response, or trackback from your own site. I remember having a Chic-a-boo but the hand with the thumb that you put in his mouth used to keep coming unstuck from the fabric and I think I eventually lost it and had a one handed Chic-a-boo. I’ve still got one of these but had no idea that this was what it was! It’s the female one, and my dad gave it to me many moons ago – I kept it because present from him were rarer than hens teeth! Nice to know what the thing actually is! I had forgotten about that Sis. The arm was all flappy at the end, wasn’t it? And Jane, glad we could let you know what that strange little monkey critter was after all this time! Im sure the word chic-a-boo has some nasty rascist connotations. i seem to remember in “police accademy” that tall black lad went batshit and rolled a car over when some idiot called the little sqeaky voiced woman a chic-a-boo. I had some similar toys, but they had arms that could be opened by pinching the shoulders (they worked a bit like bull-dog clips), they were often worn on the lapels of jackets and had different coloured fur, often bright or pastel colours. My sister had a huge collection of those toys you mention. We used to call them “clip-ons” in want of a better name. Thanks for the reminder Laura, I’m going to add these to my list of topics for future posts! When I first met my husband at work, we somehow got talking about Chicaboo’s and we both had them as kiddies. In fact we still had them, and well that was 18 years ago, and are Chicaboos and us are still happy together!!!! Still both in their outfits we made for them also!!!!! away i think i might claim it back and give it to my daughter macy. The box with a roof on it does seem to ring a bell actually maxine. I think you may well be right. Would love one again, can they still be purchased ? I always wanted one as a child but was never bought one! I bought my 6 yr old daughter a boy monchhichi (chic-a-boo) on Amazon last week and she hasn’t put it down! I have now ordered her a girl one from ebay too! You can get hold of them easily! Adorable these were. They came in 3 different sizes if I remember rightly.